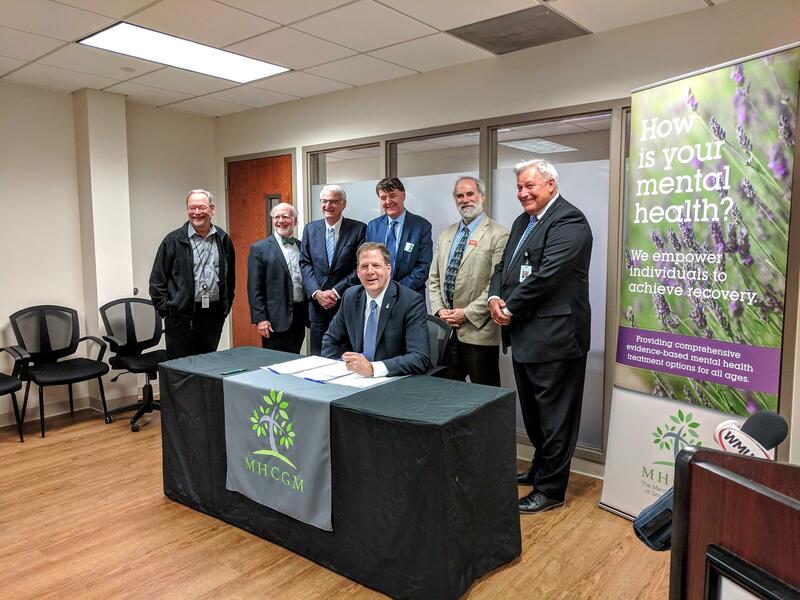 Governor Chris Sununu signed three executive orders Tuesday designed to address recommendations from the state's new 10-year mental health plan. One executive order creates a commission to study the intersection of mental illness and the justice system, including how the state can better treat inmates with mental illness so that they don't re-offend. A second executive order creates another study commission that will focus on how to attract and retain mental health care workers in New Hampshire. A third creates a new division of "performance evaluation and innovation" within the Department of Health and Human Services to look for cost-saving measures and efficiencies. Governor Sununu says these executive orders, along with proposals included in his budget, will go a long way toward implementing the state's 10-year mental health plan. "We're really at an opportune point here in New Hampshire where we can really take what we talk about to the next level," said Sununu, "really put into action a lot of the things that we've hoped and dreamed about." The two study commissions are due to start issuing recommendations by November, 2019. Sununu signed the orders at the Manchester Community Mental Health Center.